Our Special Offering this month will be directed to support the work of the Correctional Institutions Chaplaincy of Santa Clara County (C.I.C.) C.I.C. is a non-profit corporation founded in 1962 that operates with the local governmental agencies involved with corrections work. The ministry works directly with the men, women, boys and girls incarcerated in our county jails and juvenile facilities. The funding for this ministry comes from Santa Clara County, individuals, and through the support of churches such as ours. Just as Jesus ministered to those in prison, we can do likewise with our financial giving. “I was in prison, and you visited me.” Matthew 25:36b. We have received $517 toward our goal of $600. Transformation: Art From Within is an exhibit of art created by prisoners at Elmwood Correctional Complex. These pieces and many others are part of a larger exhibit that affirms the humanity and dignity of the human beings incarcerated in our jails. The art and writing show that there is more to them than their criminal charges. Their work exhibits introspection, spirituality, promise and hope. The Art and Spirit ministry is a program of CIC Ministries. The Art and Spirit ministry encourages refocusing and introspection by enriching the spirit and creative lives of the incarcerated. 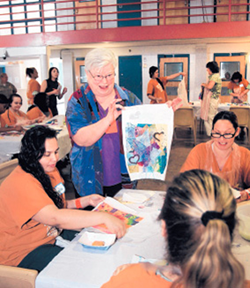 Art is the vehicle that offers opportunities to learn skills necessary for life within and outside of the jail. The return of inmates to the community calls us to provide programs which demonstrate more spiritual and loving ways to live. Do you have a good book or two that you would like to pass on to someone else to enjoy? The Correctional Institutions Chaplaincy (CIC) of Santa Clara County distributes the following types of books to inmates: Bibles, devotionals, Biblical reference books, self-help books, and dictionaries. They do accept hardback books, only if the covers are removed, and they do not accept textbooks. The Mission Task Team has set up a collection box in the Narthex for this purpose. Bring your books for donation to church with you. Our Special Offering this month will be directed to support the work of the Correctional Institutions Chaplaincy of Santa Clara County (C.I.C.). A non-profit corporation founded in 1962 that operates with the local governmental agencies involved with corrections work, this ministry works directly with the men, women, boys and girls incarcerated in our county jails and juvenile facilities. The funding for this ministry comes from Santa Clara County, individuals, and from the support of churches such as ours. Just as Jesus ministered to those in prison, we can do likewise with our financial giving. “I was in prison, and you visited me.” Matthew 25:36b. Please give generously to reach our goal of $500. Our Special Offering this month will be directed to support the work of the Correctional Institutions Chaplaincy of Santa Clara County (C.I.C.) C.I.C. is a non-profit corporation founded in 1962 that operates with the local governmental agencies involved with corrections work. The ministry works directly with the men, women, boys and girls incarcerated in our county jails and juvenile facilities. To date we have received $476 toward our goal of $500. To date we have received $371toward our goal of $500. To date we have received $176 toward our goal of $500.